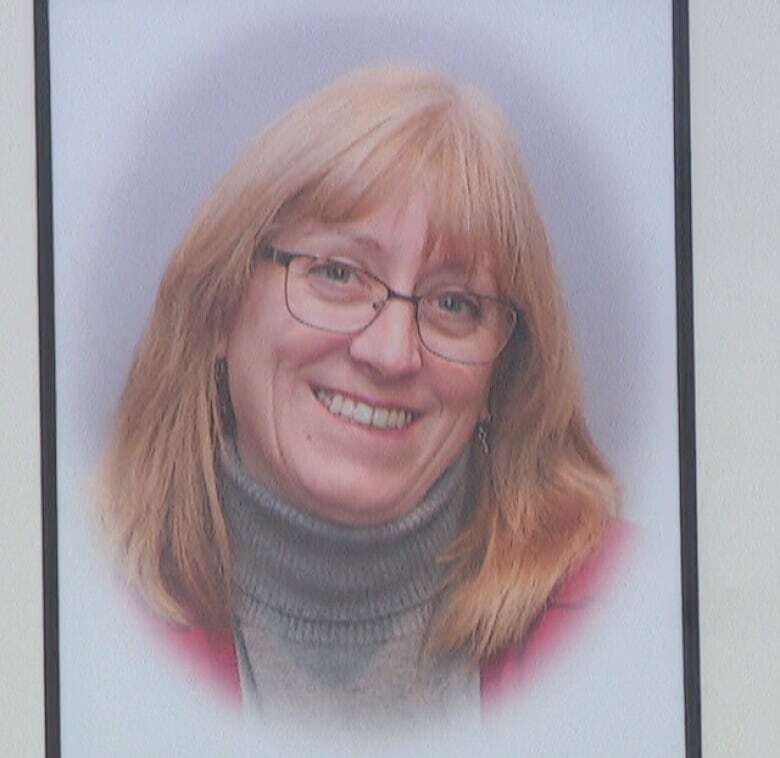 It was standing room only Saturday at a community hall in Almonte, Ont., as hundreds gathered to remember the life of Judy Booth, one of three civil servants killed in a fatal bus crash earlier this month. 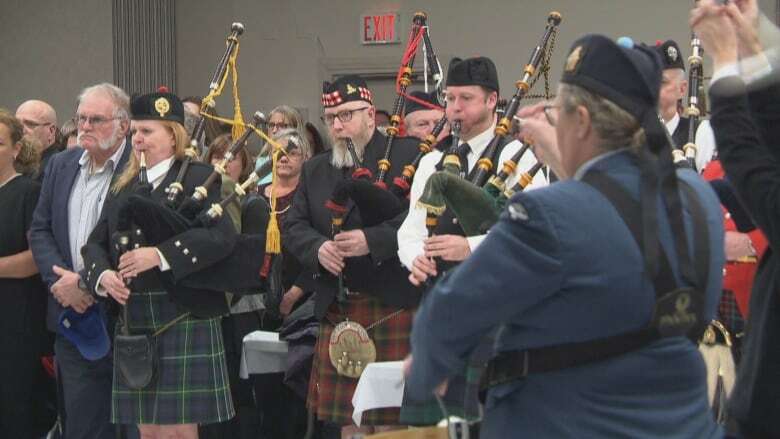 It was standing room only Saturday at a community hall in Almonte, Ont., as pipers and drummers filled the room with the music Judy Booth loved to play. The 57-year-old was one of three public servants killed Jan. 11 when an OC Transpo bus crashed at Westboro station. People from the many community groups Booth belonged to wiped away tears as they remembered her life — a life cut too short, friends said, but one that was well-lived. "Even though our world has stopped, it doesn't mean the rest of the world has," said Karen Benvie, one of Booth's daughters, in front of the packed room at the Almonte Civitan Community Hall. "Every day we must persevere to get out of bed and face the world, because that's exactly what mom would do." Karen Benvie and her sister Holly both shared touching, funny stories of their mother. They said the family was overwhelmed by the generosity from all the communities their mother was part of — an outpouring of support that spoke to the kind of woman Booth was. "We can't change the fact that our mom is gone, but we will continue her legacy by getting up and facing every day [with] the same kindness, courage, compassion, warmth — and love of kilts," said Benvie, offering the crowd a moment of relief and laughter. 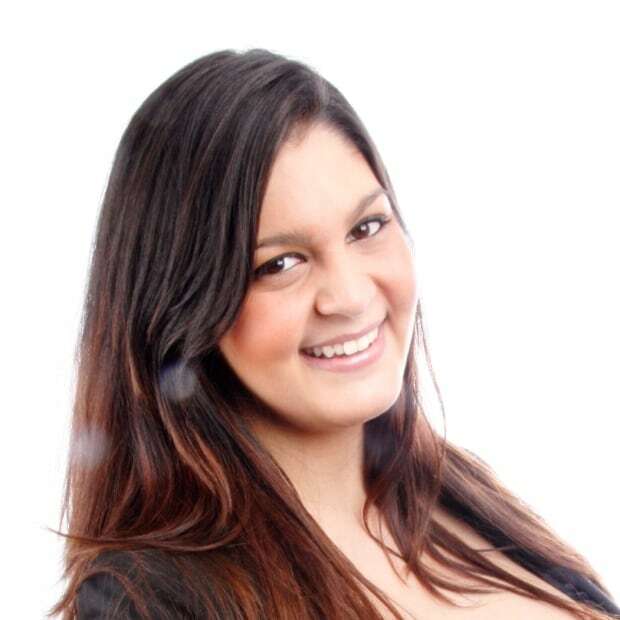 "To do it any less would be an incredible dishonour to her memory." Booth had retired from the National Capital Commission but still assisted in the access to information and privacy office, where she'd been working the day of the collision. She was also involved in organizing the North Lanark Highland Games in Almonte, and was a drummer in a number of local pipe bands, including those belonging to Ottawa police, the RCMP and the Ottawa Highlanders. 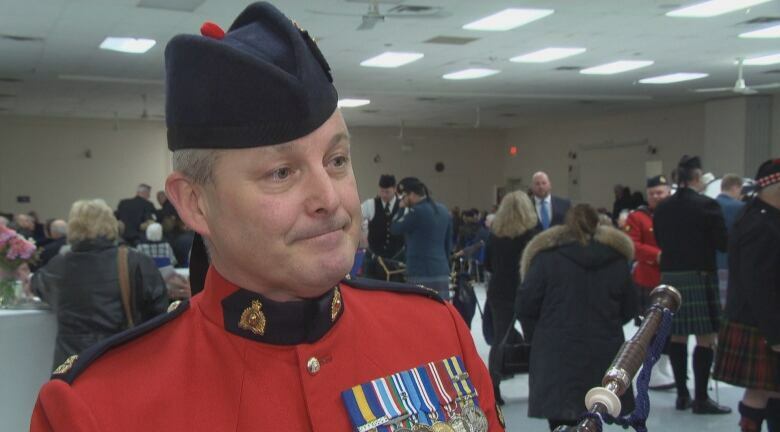 About 60 pipers played to honour Booth at the service, including Brad Hampson, who knew her for more than a decade. "She was a very warm, loving, kind-hearted person. Somebody that would help anybody in their time of need," said Hampson. Hampson said he'd remember her positive, optimistic personality, as well as her involvement with the community through the Highland Games and and her love of animals. Booth raised butterflies, he said, and had two cows she liked to spend time with. "Everybody's still very sad, shocked about how it all happened," said Hampson. "Even though she had many more years still left ... I think we will all have absolutely great memories of our time spent with her." 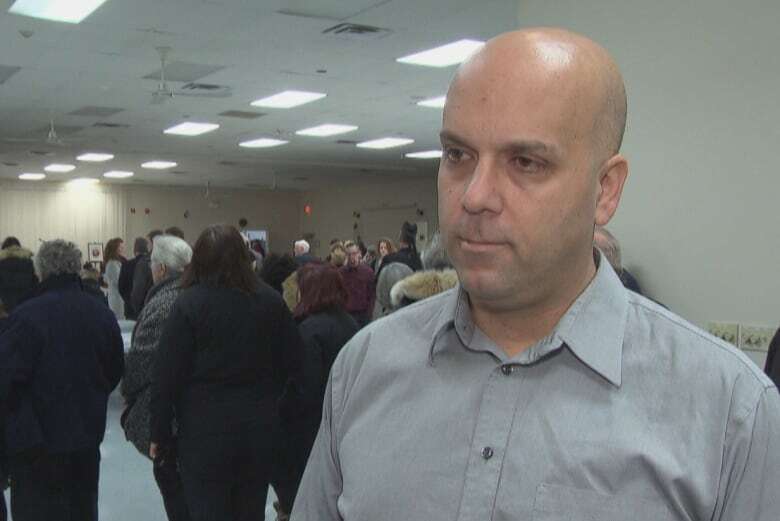 Many of Booth's colleagues attended the service, including Daniel Mongeon, who said he'd always cherish how welcoming she was when he started his job. "She smiled at me and she just gave me a hug," Mongeon said. "What I miss the most [is] her smile, her positive attitude, her willingness to help everybody, her music." Mayor Jim Watson, OC Transpo general manager John Manconi, and Coun. Eli El-Chantiry also attended Saturday's service. People who would like to honour Booth with a donation are asked to consider the North Lanark Highland Games. Two other civil servants, 65-year-old Anja Van Beek and 56-year-old Bruce Thomlinson, also died in the crash. An additional 23 people were injured. 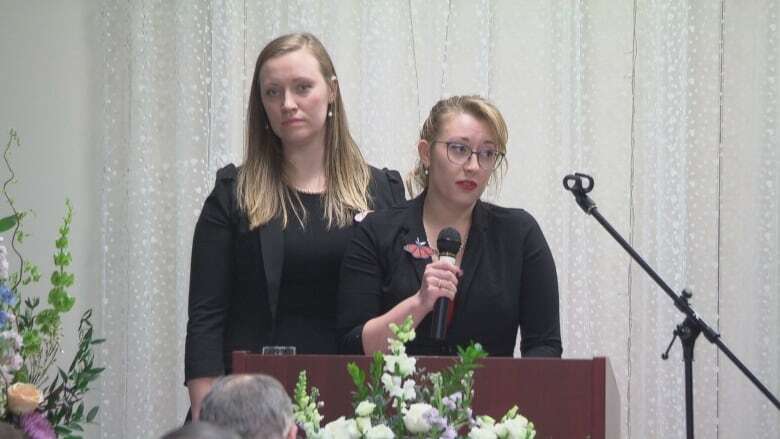 A memorial service was held for Thomlinson Friday, while a private celebration of Van Beek's life has also already taken place. Police are still investigating the cause of the crash, with the help of collision specialists from the Transportation Safety Board of Canada. Officials believe the investigation will be a lengthy one.